This year has been off to a busy start! I'm busy behind the scenes working on lots of exciting content to bring you all! When I did my Happy New Year post, I realized there were several projects I hadn't blogged about, so I figured I'd share them now. First up is this gorgeous Swoon Evelyn Market Tote I made as a diaper bag for my friend. If you've been here a while, you may remember my first Evelyn, which looks very different than this one. That's one thing I really love about making bags: you can use the same pattern and come up with a completely different look! This bag was so special for me. I've been friends with the recipient since Kindergarten! I thought about what I liked and disliked about my own diaper bag, and came up with Evelyn. I only made 2 small additions; one was to add a large elastic pocket inside. The other was adding a loop with a swivel clasp to keep keys handy and easy to find. I know a lot of diaper bags have cross-body straps, but in all my "diapering" years, I can't ever remember carrying my loaded diaper bag cross-body. I love the recessed zipper because I found I was always wanting quick easy access into a diaper bag, but also appreciated the security of a zipper when I wanted it. I made sure to have a vinyl bottom and feet, because, let's face it: diaper bags get put down in a lot of yucky places! Plus, it looks pretty awesome with black vinyl and silver feet against the gloriously bright colours of the fabric collection. Of course, this isn't as big as some diaper bags, and that's just how I liked it, and how I envisioned my friend would like hers. I found that I never really carried too much in my bag, and I would have appreciated a stylish large purse, big enough for my wallet, phone, keys, and the baby essentials. This stunning fabric is from Alison Glass' Ex Libris collection (from Fabricspark.com) plus a few prints from her Sun Prints collection. The Art Theory panel is the main focus of the bag and I think the stark contrast of the black vinyl and silver hardware is a perfect combo. For this bag, I used a foam interfacing instead of craft fuse and fleece, like the last one, and I really love the structure the foam provides. All the fancy bag bling, aka hardware, came from Emmaline Bags, don't you just love it all?! I also made a matching teether blanket and keychain, plus a Swoon Coraline in coordinating prints from the same collection. 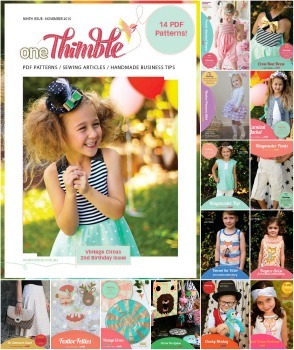 Back in November I was excited to share with you that I had an article in One Thimble, a digital sewing magazine. Now, I've joined a blog hop to show some of the great patterns from Issue 9. As I mentioned in my November post, I've been wanting to try FMA - Free Motion Applique (or free motion embroidery, as far as I know they're the same thing, at least they are in this situation), so when the opportunity to join other bloggers and sew up some items from One Thimble Issue 9 came up, I decided now is the time to give it a try. I put my name down for Vincent the Victor free motion embroidery pattern, and as luck would have it, the very next day, my son asked me to make him a fox bag. The stars aligned in my sewing world! After cutting out the pattern pieces, and fusing interfacing and webbing. Peeled off the fusible webbing backing and assembled the pieces; now fusing the assembly in place (I appliqued mine directly on to my bag front instead of an additional backing - this option is mentioned in the pattern as well). My stitching lines all marked out and ready to go! For the actual stitching, I used my free motion (darning) foot and had quite a bit of fun with it. Once that was done, I assembled my bag like normal. I used Thread Riding Hood's Forest Glen Satchel, without the flap and side accent pieces; it was the perfect shape and size for this fox, and for my son, who requested a bag to carry his dinosaurs around in. Of course, Vincent can be added to many different items: T-shirts, pillows, fabric baskets, or even a quilt! This was such a fun project! I really enjoyed rummaging through my scraps to find the perfect "clothes" for Vincent. There's so many variations that can be done too! Issue 9 offers 2 Free Motion Embroidery patterns, which you can buy individually, as a bundle, orjust get the whole issue for best value. Check the links at the bottom of this post to see what everyone else was up to! Here are a few pictures of my finished bag - and one happy boy! I'd love to hear what you think! Have you tried FMA yet? If you're on Instagram, you've probably seen many of these #2015bestnine; they're so much fun! I just googled and found a site that generated my most liked Instagram posts for me. It was a great way to have a quick look back through my projects. 2015 was this blog's first year and I'm happy to say it's been a great ride! I created some tutorials, worked with amazing designers for sew alongs and testing, played with gorgeous fabric, and even made some videos! Thank you so much to everyone who joined me. I hope to have an even better 2016. I don't usually do New Year's resolutions, but this year I decided on one: I'd really like to focus on learning new sewing skills by trying some different things. Don't worry, I'll still make plenty of bags! I'm thinking of taking a few more ﻿Craftsy classes﻿* and signing up for Creative Bug*, plus trying some different designers' patterns and this WILL be the year I try garment sewing. Do you have any New Year's resolutions this year? Sewing, or otherwise? I'd love to hear them! Leave me a comment if you want to share.